This is NOT a beginner free-motion class. You MUST have some basic free motion skills to take this class. We will NOT go over basic things like pulling up bobbins, tying off, what needles and thread to use and moving around. Your basic ruler - what can you do with the basic ruler that came with your Westalee foot? 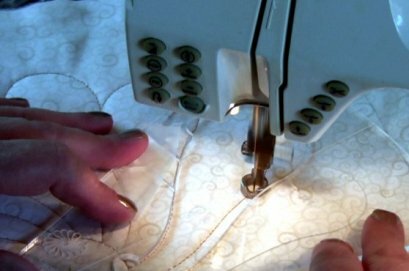 Requirements: Advanced Signup Required **If you bought your ruler from THE SEWING CIRCLE, please show your receipt when signing up for class so that you will not be charged for the class. Sign up either on the phone (970-672-2147) or in person. 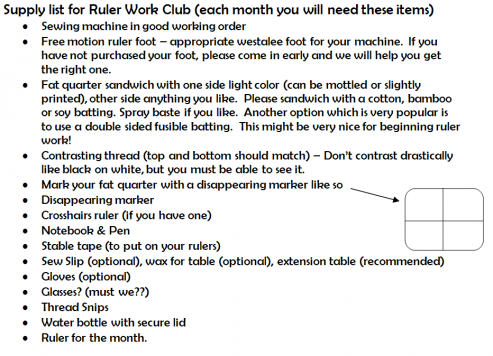 If you purchased elsewhere but plan to purchase future rulers from us, please speak with Melissa.